Get Loans at subsidised interest rates, Avail Govt. Scheme, Fee Concessions, etc. MSME sector were broadened significantly under the MSMED Act, 2006, which recognized the concept of “enterprise” and to include both manufacturing and services sectors, besides defining the medium enterprises under MSME Sector. Thus, the entire non-agricultural sector of economy was brought under the coverage of MSME Sector subject to the revised criteria prescribed for defining Micro, Small and Medium Enterprises separately for manufacturing and services sectors. Who can Apply for Udyog Aadhar ( MSME) Registration? Udyog Aadhar or MSME Registration can be taken by any type of business entity in India. a Sole Proprietorship , Partnership Firm, LLP, Company, Hindu Undivided Family, Association of Persons, Co-operative societiey and Self Help Group. 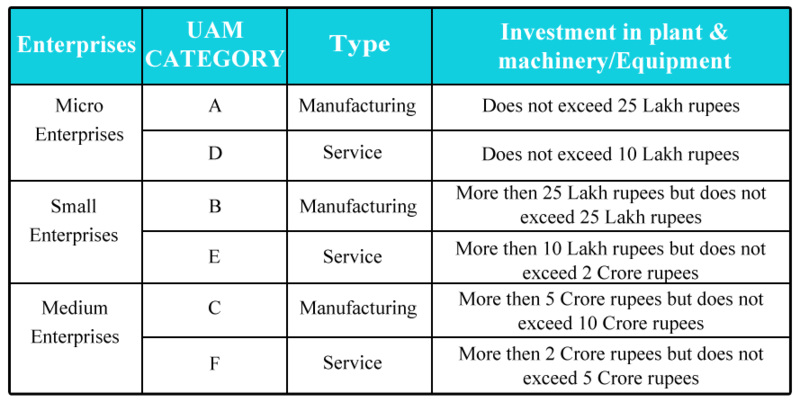 Eligibility Criteria based on Maximum ceiling limit of Investment made for Plant & Machinery ( in case of Manufacturing Industry) and Equipment ( for Service Industry) and MSME Clasification is based on Investment amount. Only those entities that can be classified as a micro, small or medium enterprise under the following criteria as per the MSMED Act, 2006 is eligible to take Udyog Aadhaar number . Though your entity is fall under micro, small or medium as per the Act, it is not madatory to take registration. You take the Registration voluntarily any time provided you have the Aadhar Number, PAN and Bank Account at the time of registration. MSME registered Business can avail benefits of all the government schemes such as an easy loan process under various scheme for MSME, loans with subsidised rates of interest etc. The Micro and Small Enterprises are also eligible for collateral-free loans up to Rs. 1 crore under the Credit Guarantee Fund Trust for Micro and Small Enterprises (CGTMSE Scheme). This is a collateral free loan and the Central Government takes guarantee of the borrower and To improve the timely funds’ availability to the MSME Sector, the Government of India has classified loans to Micro and Small Enterprises under priority sector lending. 50% Govt fee concession in filing of Trademark and Patent registration. Facilitate hassle-free opening of current bank accounts in the name of the business. Receive financial support for participating in foreign expos to showcase their products. Micro and Small enterprises also enjoy Other Subsidies from State Governments such as extended credit facilities, Industrial extension support, and services, Assistance in marketing, Assistance for construction of industries in underdeveloped areas, Technical consultancy, assistance in the capital, Excise exemption and Exemption under direct tax laws etc. Aadhar Number - 12 digit Aadhar number issued to the applicant ( Proprietor / Director / Partner) should be filled in the appropriate field. Validate Aadhar - The applicant must click on Validate Aadhar button for verification of Aadhar, after that only user can fill the form further. Reset - The applicant can click on reset button to clear the field of Aadhar No and Name of the owner for different Aadhar. Social Category - the Applicant may select the Social Category (General, Scheduled Caste, Scheduled Tribe or Other Backward Castes (OBC). The proof of belonging to SC, ST or OBC may be asked by appropriate authority, if and when required. Postal Address - the Applicant should fill in the appropriate field the complete postal address of the Enterprise including State, District, Pin code, Mobile No and Email. Date of Commencement - The date in the past on which the business entity commenced its operations may be filled in the appropriate field. Major Activity - The major activity i.e. either "Manufacturing" or "Service" may be chosen by the enterprise for Udyog Aadhar. NIC Code - the Applicant may choose as appropriate National Industrial Classification-2008 (NIC) Code for the selected "Major Activity". Person employed - The total number of people who are directly been paid salary/ wages by the enterprise may be mentioned in the appropriate field. Submit - The Applicant must click on Submit button to generate acknowledgment number. Our MSME Expert give on call consultation to client first to make him clear about the process of registration and Documents requirement. Our MSME Expert prepare your application and co-ordinate with you to collect all information required for drafting. Once we finish drafting, file your application online with Department. You get the Registration Certificate on the same of filing at your registered Email ID and Also we send you a copy on mail. Under Udyog Aadhar, Registration is 100% online. Under Udyog Aadhar, UAM ( Udyog Aadhar Memorandum) can be filed by self-declaration on the details of the enterprise. Under Udyog Aadhar, One can file more than one Udyog Aadhaar with same Aadhaar Number. Under Udyog Aadhar, There is No Govt. Fee for filing. Under Udyog Aadhar, Once it is filled and uploaded, the registration number is received at registered email ID. TO AVOID ANY ERROR OR MISTAKE, IT SUGGESTED TO TAKE THE SERVICE OF CONSULTANT. WE HELP YOU TO GET THIS DONE SMOOTHLY. It is important your Application is filed correctly and properly as per guidelines. Our Experts are well experienced in this line to get your work done smoothly. What is the genesis of Udyog Aadhar? The ministry for micro, small and medium enterprises had in September’15 notified Udyog Aadhar, taking a cue from the prime minister's radio show “Mann Ki Baat”, where he had talked about simplifying procedures to start a business with a single-page registration form. A large chunk of enterprises in India are simply not registered due to the cumbersome paperwork involved in the process and, therefore, can't tap the government schemes for them. The KV Kamath panel on financing the MSME sector, that has been the biggest job creator in recent years, had recommended that the registration should be universalised. The concept of Udyog Aadhar and ease of registration have thus originated to ensure wider coverage of MSMEs to avail the benefits under various Schemes of Central/ State governments. Udyog Aadhaar Memorandum is the registration form wherein the MSME certifies its existence, and provides mandatory information such as owner’s Aadhar details, bank account details, Business activities, Investment in Plant & machinery, etc. Post submission of this form, an acknowledgment is generated and send to registered email of the applicant containing the unique UAN (Udyog Aadhar Number). As it is a self-declaration form, there’s no need for any supporting documentation. Note:( Even though supporting documents are not required, any central or state authority can ask for specific documentation as proof of information provided in the UAM form). Aadhar OTP Verification is required for Udyog Aadhar Number (UAN) Registration? Yes. At the very initial of registration process,, you need to put your Aadhar Number and get this verified with OTP send to Aadhar registered Mobile number. Whether the multiple system of registration may exist after introduction of UAM? How to select NIC Code of the Activity performed by the enterprise. NIC code can be selected once the aadhaar number is validated and major activity (manufacturing or service) is selected. In order to simplify the selection of appropriate NIC code, a three-stage drop-down list is available to the users. What would happen to those enterprises which do not have Aadhar Number? EM-I filed by a prospective enterprise entitles it for certain exemptions from paying stamp-duties. How to handle this in UAM? No. However, GM DICs, on the UAM portal, shall be able to enter their remarks on the respective information provided by the entrepreneurs while filing the UAM online. What is the future of EM Portal created by Ministry of MSME i.e. http://em.msme.gov.in? Why power load details have not been asked in UAM? Will there be any updating of data by the entrepreneurs on the UAM portal? How the closing of the business unit is recorded the entrepreneur in the UAM?